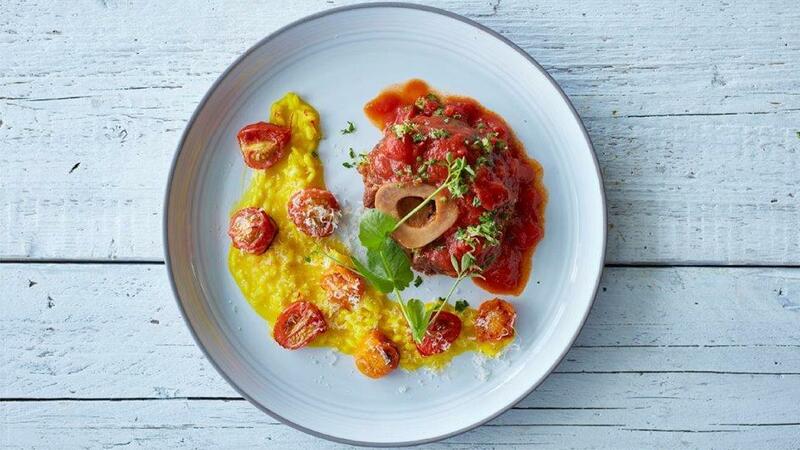 A classic dish of the Lombardy region in Italy, the Osso Bucco with risotto Milanese is an Italian mothers cooking. A slow braised veal shank with saffron risotto. Knorr Tomato Pronto makes this dish quicker and easier to prepare. Get cooking on this recipe today! Season the veal shanks with salt and pepper. Fry the shanks in vegetable oil until golden brown. Prepare Knorr Demi Glace Base, by simmer with hot water until just dissolved and add to the shanks. Fry the chopped shallots in olive oil without coloring. Add the rice and fry it gently for 2 minutes. Dilute Knorr Chicken Stock Powder, in hot water and add in small steps to the rice. Stir on a low fire. When the bouillon is soaked into the rice and the rice is “all dente”. Add the butter and the parmesan cheese.